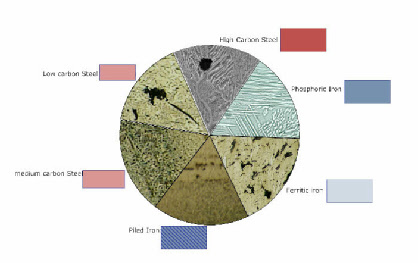 Archaeometallurgical analysis of archaeological and historic iron alloys leads to the identification of six distinct alloys. Iron containing up to c. 0.3% C.
Iron containing between c. 0.3% and 0.8% C.
Iron containing more than 0.8%C, possibly as high as 2%C. A section of iron displaying bands of two or more of the other alloys. This alloy can be ‘natural’ i.e. a result of e.g. the smelting process or deliberate when the alloys are selected and welded together.